I do swear that I will bear true faith and allegiance to Belize and uphold the Constitution and Law of Belize and that I will faithfully and conscientiously contribute to the development of Belize and discharge my duties and responsibilities as a Belizean citizen. I will further respect the history and culture of Belize and refrain from any anti-social or criminal activities and devote myself to the service and well-being of the Belizean people. I pledge that I will do everything in my power to promote and strengthen democracy and the rule of law in Belize and will do everything to promote the sovereignty and territorial integrity of Belize. Last Friday, April 26th my husband and I were proud to take the Oath of Allegiance and become Belizean citizens. It has been a long process, and one that took some perseverance and just old-fashioned patience. No strings were pulled, no bribes were paid, no deals were made...we just filled out the paperwork, complied with all the requirements, sat our interviews and took the nationality test; answering questions such as “what is the national tree”? The final paperwork was filled on April 12, 2011, and two years and a few days later, we stood in a room with 180 other people from all corners of the globe, pledging our allegiance to the country we now call home. Many have asked us why this was so important to us, that we share citizenship with our native USA. To me the answer is easy...Belize is my home, Belize is where I work, live, play...Belize is where my dear friends are...so why wouldn’t I want to belong to her? Sure Belize has her problems, but what country is without them? No matter where one lives on this little blue planet, there is no such thing as a perfect world. All I know is my sense of belonging is deeply rooted in the sandy beaches of Ambergris Caye, the magic of the misty Maya Mountain Range, the ribbon of the Mesoamerican Reef and the sweaty camaraderie of a chicken bus. 35+ years ago my parents first brought me to the sleepy fishing village of San Pedro where we enjoyed the epitome of island life. Nine years ago Belize became home. At the swearing -in ceremony both Honorable Senator Godwin Hulse and Honorable Elvin Penner warmly welcomed us and filled our hearts with pride. I was amazed to learn of all the countries represented in our group, from Lithuania to Nigeria, from Germany to El Salvador and all points in between, we represented a global group of new Belizeans. They asked us to contribute to the society and in our own way help the country to succeed and prosper. 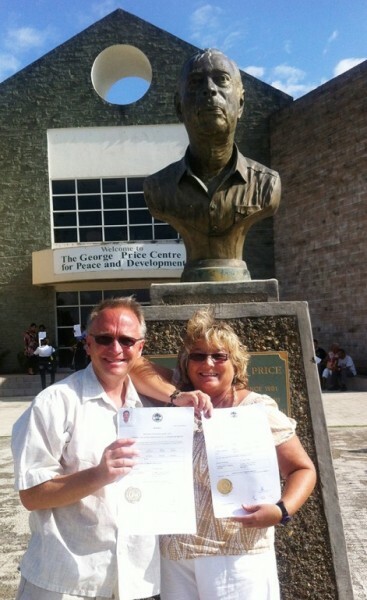 After the ceremony we posed in front of the George Price Center for photos, showing off our fancy new document of citizenship with a statue of the Father of Belize behind us. It was a day we will never forget, and finally we belong to Belize. Editorial: Who is responsible for the stories published in The San Pedro Sun? San Pedro brings in 2018 in spectacular fashion!